A fun filled way to practice shapes. 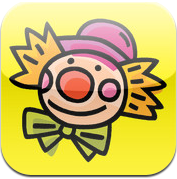 Set in a Circus theme, kids drag and drop the correct shapes and are rewarded with many colorful stickers! There are fourteen different shapes in all and twenty reward stickers to choose from!and motor skills! Loaded with circus music and sound effects. This app is presented to us by Lizz Campbell. Practice shapes at the Circus! Mr.Fox and shapes HD – educational shapes & colors learning game for toddlers & preschoolers from Mr.Fox and friends – Mr.Fox and friends, s.r.o. What was your initial inspiration for Shape Circus? My inspiration is my three year old daughter. I have seen her learn so much from apps, and we had a shape app that just wasn’t very pretty and she loved it anyway, so I decided to create a much more pretty, fun and exciting shape app! My favorite part of the app is the sticker page reward. I know how kids love stickers and rewards, and I thought this was a great way to make the fun of the app go even further!